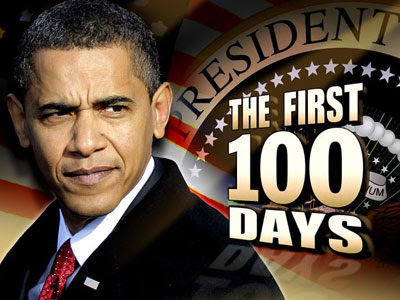 Yesterday marked the 100th day in office of US President Barack Hussein Obama. The celebration of this sacred festival was reported in a variety of media and without exception all coverage of Obama’s first hundred days was overwhelmingly positive. It was astounding to listen to the effusive, jaw-dropping panegyrics. RTÉ Radio 1 featured an American commentator—Democrat, naturally—whose smooth, slick and syrupy tribute to the wonders of the presidency thus far was lapped up eagerly and uncritically by the presenters. The only negative notes allowed to ruffle the waters were found in passing references to the inevitable ‘far right’ and that favourite bugbear of leftist journalism, the ‘religious (i.e. Christian) right’. But BBC Radio 4’s World Tonight programme, presented by Robin Lustig, went further than RTÉ in attributing a voice and a human face to those perfidious opponents of the Chosen One. The effect, of course, was to make them look ridiculous—which was surely the purpose of such coverage to begin with. In search of fruitful propaganda, the reporter, one Kevin Connolly, betook himself to the American mid-west, specifically to the state of Oklahoma, where he hoped to obtain a collection of suitably dotty soundbites from a collection of suitably dotty individuals, which would then be passed off by the BBC as representative of conservative American opinion at large. The premise: that opponents of Obama are unbalanced, uneducated, prejudiced, fundamentalist evangelical rapture-type rednecks who stubbornly refuse to render the great man his due adulation for a variety of specious reasons that no sane rational person could possibly take seriously. They are also, naturally, racist and ‘homophobic’. The BBC doesn’t have to say this, of course. The beauty of this propaganda coup is that the selected interviewees make such an arse of themselves denouncing the President that one feels positively embarrassed listening to them. One may safely assume that anyone expressing a more moderate view, or opposition to Obama on more specific and tangible grounds, would have been carefully edited out so as not to spoil the picture. We do not exaggerate. For those who may have missed it, or who are so nauseated by the shameless bias of the contemporary BBC that they cannot bring themselves ever to listen to anything broadcast by that organ, here is the source. The anti-anti-Obama propaganda starts at approximately 39 minutes in. Listen particularly to the group of “Bible-believing Oklahoman ladies who lunch” after 40:50 to get the kind of score the BBC was really after. The reporter’s caveat that one “wouldn’t wish to meet more hospitable, warmer people anywhere” is merely a disarming remark and nothing more. It’s all really rather insulting to the good people of Oklahoma, as well as to the millions who voted either for John McCain or for another candidate, to suggest that opposition to Barack Hussein is based only on this kind of stuff. Bravo comrades at the BBC, you’re doing your work well!